Social media can be a literal lifesaver for dogs who are trapped in abusive or neglectful homes. 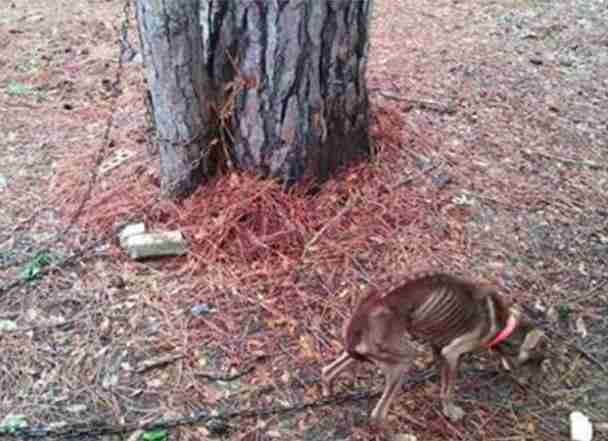 A concerned stranger noticed a chained dog outside a home in Jackson, Mississippi. The pup was dangerously thin; every rib showed in her bony body. It was clear this dog needed help - and fast. Local dog lovers began to circulate the photo, along with a message encouraging people to call the Jackson Police Department to report the abuse. Within hours, the police department posted a response on its Facebook page, thanking everyone for their concern and announcing that "the dog was taken from this residence and is receiving veterinary care. This incident is still under investigation." She's now safe and recovering at an animal hospital, and an investigation into her abusive owners is ongoing. A spokesperson for Jackson Animal Control couldn't yet comment, but hopefully this gal will not only get justice, she'll also find herself a real family. This isn't the first time this month that an image shared on social media has saved the lives of neglected dogs - a viral photo in Pico Rivera, California, recently led to the rescue of nine starving pit bulls.